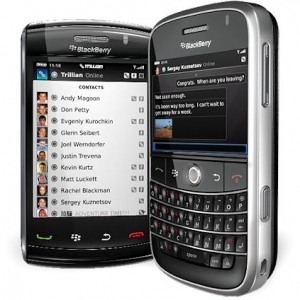 Trillian for BlackBerry gets official | BlackBerry Blast! Trillian for BlackBerry is finally official. It was out in beta recently, but now the multi-platform chat client is official for BlackBerry. You can head on over to the BlackBerry App World and grab your copy. It retails for $4.99 (a bit high), and there is no free or light version. At $4.99 Cerulean should consider a light version or limited version of some kind so you can try it out before you buy.